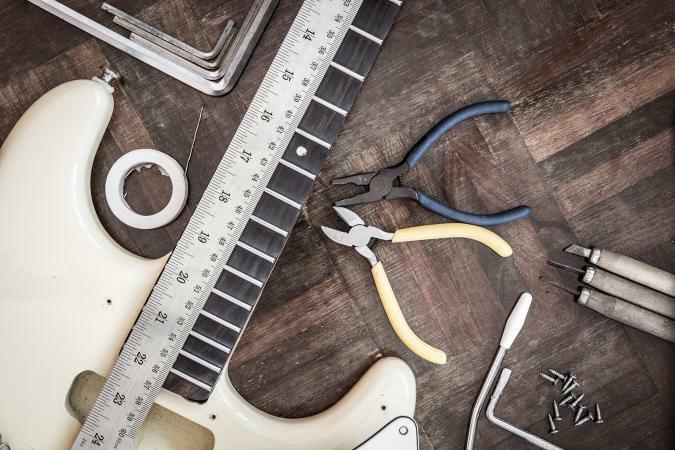 Guitars can be some of the most high-maintenance instruments to play, and it's crucial to have the proper tools to maintain and repair your guitar. Even if you plan on letting a guitar shop handle the advanced tasks, you should at least have the basics on-hand for quick fixes. Every guitar player, even beginners, will need these basic tools to handle routine maintenance tasks, such as changing strings, cleaning the guitar, and keeping the guitar sounding great with accurate intonation. Likewise, if your maintenance and repair will be on the go at rehearsals or at home in your room--i.e. if you don't have a dedicated guitar shop--it's recommended that you use a backpack with plenty of pockets to hold your tools. 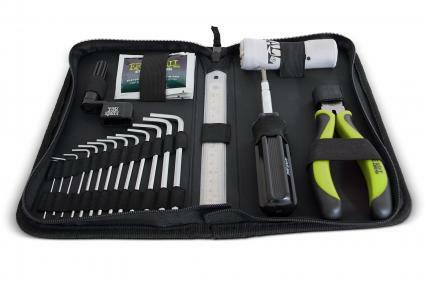 A toolbox is bulkier and prone to banging instruments and denting them. 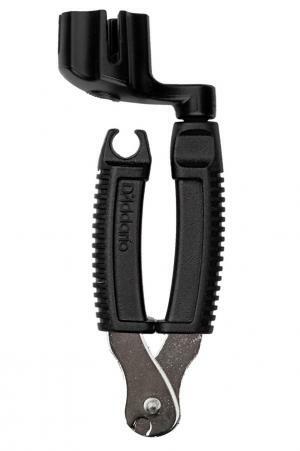 A wire cutter is a compact tool that safely cuts wires with ease and quickness. It is an essential tool for changing strings. After you put new strings on, you must use wire cutters to remove excess wire. It's not necessary to find a fancy guitar-specific wire cutter to get the job done. 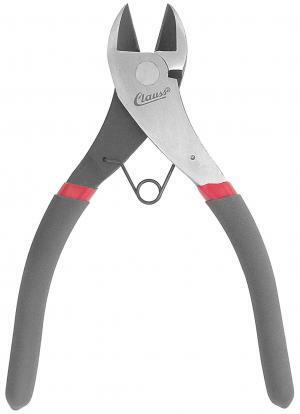 Any compact quality cutter with narrow pointed blades (which makes it easier to reach in tight spots on the guitar) at Home Depot works, such as the classic 5-star rated tool brand Clauss. A peg winder is a small crank that turns the tuning pegs for you so that you don't have to turn them with your fingers. This tool is essential for speedy string changing. While it's possible to get peg winders for as little as $1.99 online, they tend to prompt complaints for their cheap quality and inefficient function. PlanetWaves, however, always delivers consistent quality, and this version comes with a built-in string cutter. Changing strings: When you put new strings on, they get out of tune easily, and you need to tune them frequently. Adjusting intonation: When you adjust the overall intonation of your guitar, a chromatic tuner is mandatory. Without perfect accuracy of pitch, ensuring your guitar has excellent intonation is impossible. Korg, which has been in business since 1963, is a premium brand with a stellar reputation. 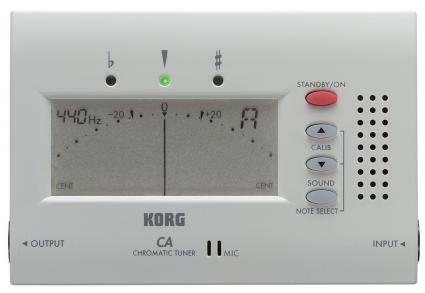 It's not surprising its product gets such good customer reviews, including the Korg CA40, a surprisingly affordable product from a great brand. Using certain kinds of metal polish to clean the metal frets on your fretboard can keep them looking great and free from dirt build-up that can affect playing and strings. 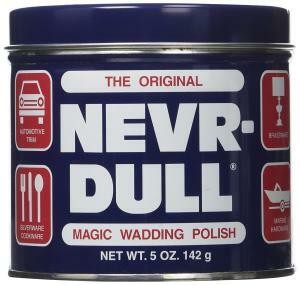 Professional guitar technicians recommend Nevr-Dull, as long as you're careful not to get the polish on wood. The product is also highly rated by users. Paper towels are fine for the job. Avoid steel wool or heavier materials unless you're highly experienced. Such materials can damage the frets if not done with care. The mild but effective nature of lemon oil makes it an excellent choice for cleaning the wood on your guitar's fretboard. Besides being the highest rated lemon oil in Guitar Center, it's made by a classic guitar brand that's been making accessories for over fifty years. Any shop rag or cleaning towel works fine. While it's tempting to buy a set of individual tools for each size and type, it's much easier to get an all-in-one hand-held driver with replaceable bits. StewMac makes the only kind of tool like this designed specifically with the guitar in mind, which makes it a must-have on the tool list. 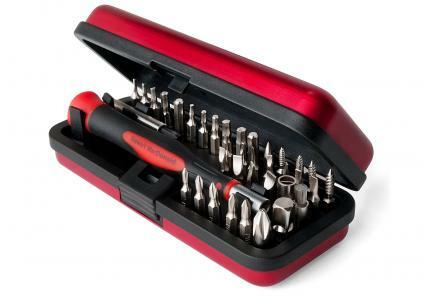 While it might seem more expensive, remember that it is essentially replacing a 34-piece toolkit with a small box and driver that can fit in your backpack. You also use them while taking pieces off to inspect tuning machine parts or the electronics of the guitar. Like the wire cutters, you don't need to get a fancy made-for-luthiers tool. 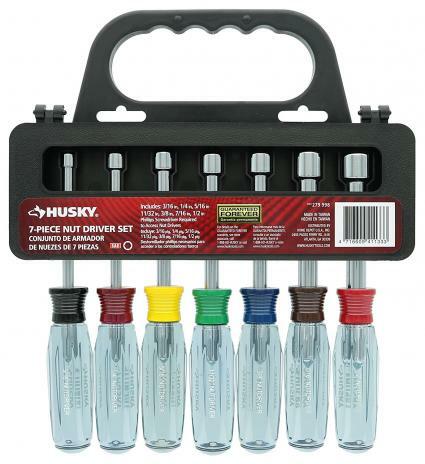 Hardware stores have plenty of options to get the job done, like the positively rated Husky nutdrivers linked above for under $20. When you do any kind of sustained work on your guitar, you need a place to put it that gives you easy access to the parts while also protecting the guitar from getting scratched or dropped. 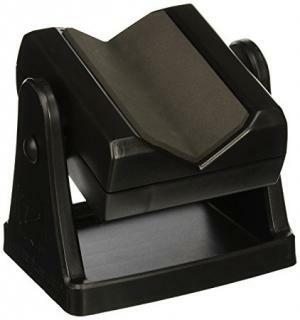 A neck cradle or bench rest meets this need. It holds the guitar up at an angle making the guitar easy to work on, and it has soft padding. It is the highest customer rated neck cradle on Amazon and one of the cheapest. If you don't care about price and want something more high end, StewMac has full-sized guitar bench rests for closer to $50. For example, if you have a loose strap button that won't stay in its screw hole, wood glue and toothpicks can secure it temporarily until you get home and can work on the problem with all of your tools or until you can get it to a shop. Alternatively, if you have a loose string nut, super glue can be a quick remedy until you can find a permanent solution. 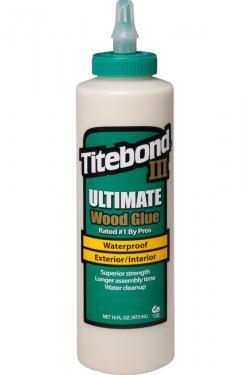 Price: Wood glue is about $4 and Super T Super Glue is around $6. Make sure to have toothpicks and Q-tips stocked up with your glues. When a screw hole is too large and causes a loose strap button, you fill the hole with pieces of toothpick and wood glue, and then the strap button can get traction with the added material. Q-tips help you clean up excess super glue. If you'd prefer to save money and venture into the DIY world of advanced guitar maintenance, these tools are mandatory to complete the repair jobs a guitar technician completes. 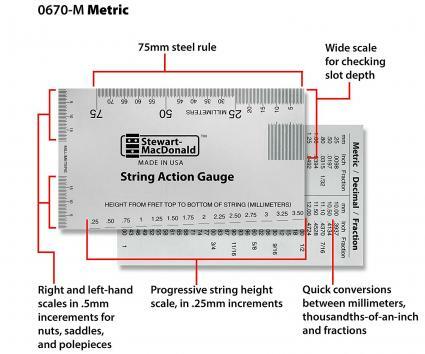 A string action gauge gives you a speedy, accurate way of measuring the very small space between your strings and the frets/fretboard, also known as the string action. You measure the string height as you are setting up and adjusting the components of the guitar to make it as comfortable and easy to play as possible. StewMac's gauge is legendary, and it has a 5-star perfect customer rating with 287 reviews. You'll need a wide variety of sizes, so it is recommended you eventually get both the imperial and metric sizes. 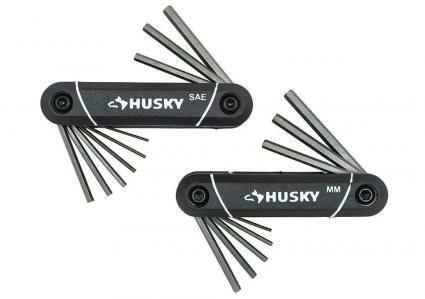 Ball-end hex keys have rounded ends, which allows you to use the tool at difficult angles. This makes it easy to get into the notorious hard-to-reach spots that guitars can have. It's another common tool with many high-quality options at any hardware store. The well-rated Husky fold-up version is easy to carry around and use. 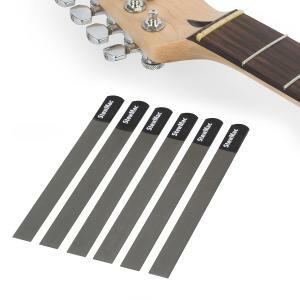 Gauged nut files are files designed for the six strings of the guitar--one file for each string--that can cut away and level the nut of a guitar where the strings rest. This set includes six files, one for each string on an electric guitar, and it is a high quality set at a lower price than its competitors. Warmoth, which also has high quality files, has a larger set (eight files) for $100. A neck shim is essentially a flat piece of wood you insert in the place where the guitar's neck attaches to the body to change the angle of the neck. In less civilized times, guitar techs would stick any flat object they could find lying around--matchstick box, random splinter of wood, picks--into the space to make adjustments. Now stores have much shims designed specifically for guitar necks that work better and won't cause long-term damage to the guitar. StewMac might very well be the only store online that offers this product. (Guitar Center, Sweetwater, and Musician's Friend do not sell them, and not even Warmoth offers neck shims on their site.) Customers are very high happy with StewMac's versions, however, with a perfect 5-star score out of 176 reviews. This knife is basically for any task that involves trimming or getting a tiny blade into a tight space. 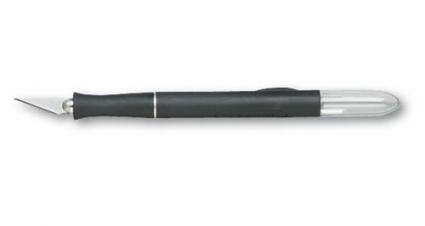 X-Acto knives are the most well-known brand for precision cutting and for good reason. Their products are fantastic quality, well-reviewed, and economic. A luthier's caliper allows you to measure fret height with perfect precision, which is an absolute must if you're attempting to do major jobs and don't want to mess up the function or sound of your guitar. It is often used while adjusting a guitar's bridge height. 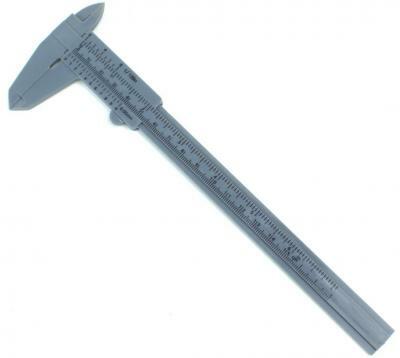 Calipers can also be used in other measuring situations--essentially any situation where you need ultra-precise measurements. 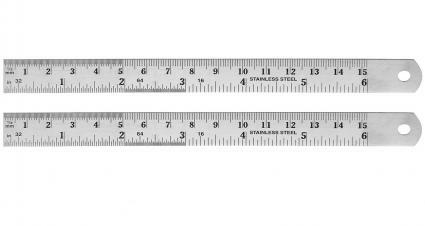 A machinist's rule is essentially a ruler that helps you find the center points of parts on your guitar when you are making wood shop-style modifications (i.e. drilling, cutting, etc.). This is a common item you can buy in many stores, but Micro-Mark combines a very low price with the quality that comes with being a company that specializes in making small tools for hobbyists. 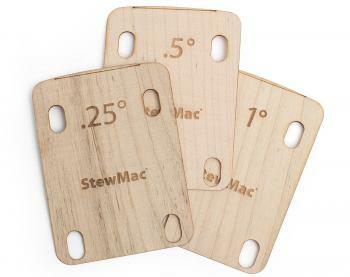 StewMac has handy guitar-specific rulers for a higher price, but the low-cost utility of Micro-Mark is hard to beat. 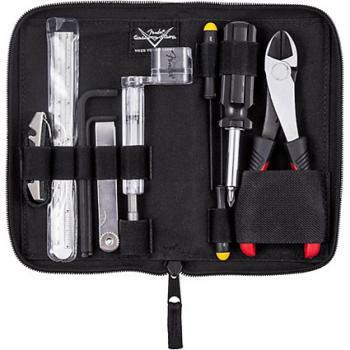 If you'd rather just buy a product that is a one-stop shop with many of the essentials ready to go in one place, a guitar repair tool kit is the way to go. Ernie Ball and Fender are both quality guitar brands that make good products. The artisan craft of guitar repair and building, which is done by a luthier, has its own world of tools, suppliers and products. The specialized nature of the craft means there is a small list of brands who supply their tools. For this reason, if the cost is sensible for a home hobbyist, brands and suppliers used by luthiers will be recommended, such as StewMac and Warmoth, which sell luthier-specific tools that are guaranteed to have the highest quality for guitar maintenance. However, many common stores such as Musician's Friend, Home Depot, and Guitar Center offer basic tools that are cheaper and don't need to be artisan-level. These tools will be recommended as well if they have superb customer ratings. If you have a passion for the guitar, acquiring new tools, even if you have to build up your supply gradually, is one of the delights of playing the guitar. It can bring the satisfaction similar to an artisan craftsperson to not only know how to play the guitar, but also how to take excellent care of it.